As I work on cleaning up and finishing my dissertation, I’m creating ‘distilled’, snack-sized versions of each chapter. I hope this helps me: a) see the ‘big picture’, b) get high-level feedback from more people, and c) entice people to read the real thing. This post distills “Making Room for Modest Conceptual Functionalism”. When we talk about ‘what it feels like’ to be in some mental state, we use phenomenal concepts. When we talk about causal architecture, we use functional concepts. The main question I want to look at: How are phenomenal concepts related to functional concepts? I find it useful to think about this question in the following way: Imagine we have two lists. On one list, we have every possible phenomenal description. On the other list, we have every possible functional description. We can answer our original question by answering: which functional descriptions can be read off which phenomenal descriptions, and vice versa? With that model in mind, I want to give a high-level sketch of the space of possible views. Ambitious conceptual functionalism: for every phenomenal description, there’s a matching functional description that both entails it, and is entailed by it. Conceptual dualism: The phenomenal is conceptually independent of the functional. Phenomenal descriptions don’t entail functional descriptions, and vice versa. 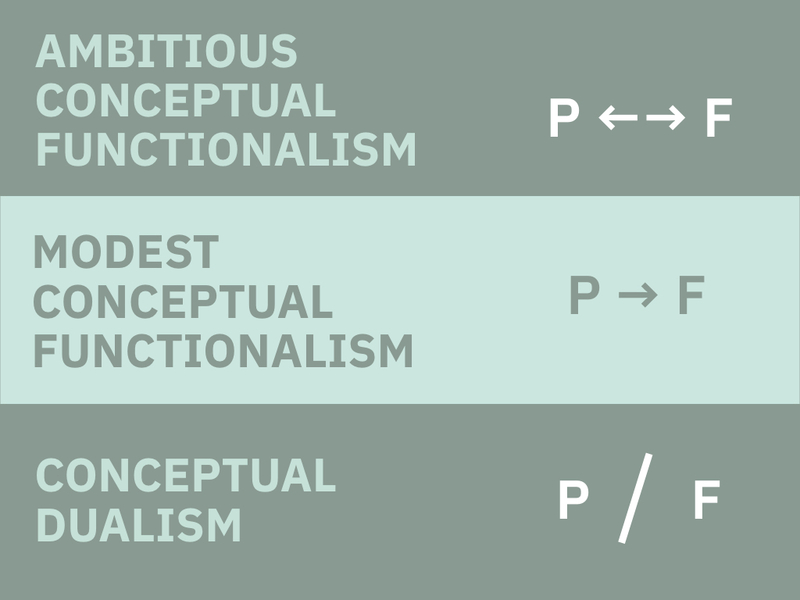 Modest conceptual functionalism: Some phenomenal concepts have built-in functional constraints. So while functional descriptions don’t entail phenomenal descriptions, at least some phenomenal descriptions entail functional descriptions. Modest conceptual functionalism, as a category, covers any view that eschews functional-to-phenomenal entailments but embraces some form of phenomenal-to-functional entailment. But which sorts of functional constraints on phenomenology are plausible? Where should we look? The intelligibility of physicalism: Even if physicalism isn’t true, it at least seems like an intelligible view—more intelligible than the view that phenomenal consciousness is the rate of economic growth in Bulgaria. Modest conceptual functionalism can make sense of this intelligibility, while conceptual dualism cannot. The tractability of a science of consciousness: If conceptual dualism were true, it would make a science of consciousness impossible. Confronted with two different hypotheses about the actual correlation between phenomenal properties and functional properties, we wouldn’t know how to bring objective, third-personal evidence to bear on this issue. Even if there aren’t any entailments from the functional to the phenomenal, we could still use phenomenal-to-functional entailments to help provide ‘guardrails’ for our empirical project.